Designed by Julian Everitt, went into production in 1976 and to date there are in the region of 250 E-Boats around the world. She was designed to comply with IOR rules and is basically a 22 feet, four berth trailer/sailer. Numbers of this versatile cruiser racer have grown in recent years at Skerries. The E-boat has a lifting keel which means it can sit on a more sheltered Skerries drying mooring. The boats are also popular in Clontarf for the same reason. Skerries has the second largest fleet of E Boats in Ireland and to date have 7 boats actively racing. Clontarf continues to have the largest fleet of 20 boats. 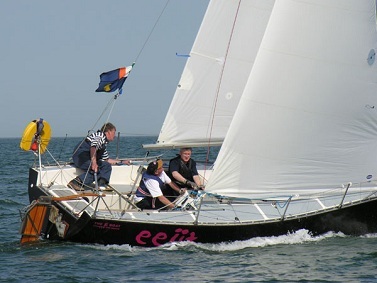 The E-boat has one of the best racing records in Skerries Sailing Club, racing within the cruiser class and is more than a match against other racing yachts. Also a popular boat with new members, looking to get bigger boat experience. The fleet is always looking for crew members.